ACCESS is a national livelihoods support organization, with focus on incubating innovations for sustainable livelihoods of the poor. With support from DFID (Govt. 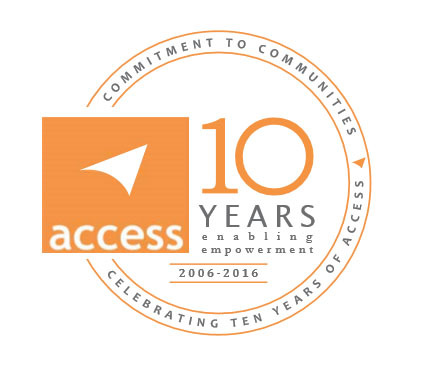 of UK), ACCESS was established in March 2006 as a professional new generation agency to contribute to and support poverty reduction in India. ACCESS is uniquely structured to work at all levels of the development sector value chain, from implementing programmes on the ground, working with the Civil Society Organizations, Government Departments, Corporate Sector and Multilateral / Bilateral Agencies, and also supporting policy at the national level. In the last decade, ACCESS has gained recognition for incubating innovations in livelihoods that has helped to move the economic lot of the poor from subsistence to sustainable levels. ACCESS works both in rural as well as in urban areas. Currently, ACCESS has 32 on-going programmes and works in 9 states in India with over 60 full time professionals in managerial positions and 240 field staff to support programme implementation. Ability to work at all levels of the sectors.